There are concerns the changes will reduce international student engagement in USU elections. In a break with previous years, this May’s USU Board elections will not feature polling booths in the Merewether building or on Cadigal Green, and the International Students’ Lounge (ISL) booth will operate only for pre-poll, staying closed on election day itself. And in a further change, the USU will require all campaign material written in a language other than English to be accurately English translation into English directly below. This rule has been in force since 2016 as an ad hoc ruling of the Returning Officer, but has only now been incorporated into the formal regulations. These two decisions, passed unanimously in March’s Board meeting, have sparked concerns over international students’ engagement with the election. Board Director Hengjie Sun spoke out against the polling booth closures during the March meeting. He questioned why the Merewether booth was being shut despite its proximity to areas popular with international students, like the Abercrombie Business School and SciTech Library. Sun went on to suggest international students might be “disenfranchised”, since awareness of USU politics was already low in that community. Sun eventually voted in favour of the closures. Honi understands that it is Board practice for the Directors to either vote with the majority or abstain. Sun, an international student himself, is a member of the Chinese students’ political grouping Panda. He is part of a recent surge in international student involvement in both USU and SRC elections, which saw Yifan Kong elected to Board in 2016, and Sun and Zhixian Wang in 2017. Panda took seven council seats at last year’s SRC election. Board Director Grace Franki rejected suggestions that the closures had anything to do with international students. “The Merewether booth has been closed due to concerns that the placement of the booth at the top of a long flight of stairs was dangerous,” she told Honi. In fact, the new JFR booth will have to do triple duty, servicing an area once shared between Merewether, the ISL station and the old Cadigal Lawns booth. Between them, these three booths recorded 785 votes at the 2017 election. 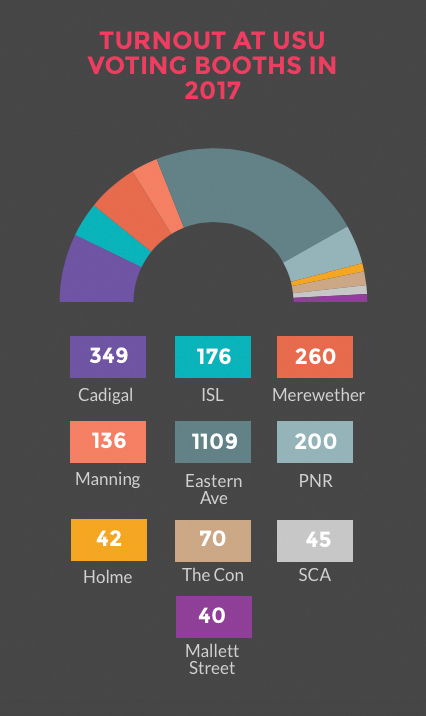 The Cadigal Green and Merewether booths were the second and third most popular polling stations, with ISL lagging behind PNR as the fifth most popular. SRC General Secretary Yuxuan Yang, a Panda member, argued the booth closures would make it difficult for voters, particularly international students, to find a place to vote. “Voting places should be equally distributed in different areas of campus via population density and the different groups of people’s percentage,” he told Honi. Though the rule has technically been in force since 2016, observance has been patchy. During the 2017 elections, Zhixian Wang courted controversy by chalking Chinese graffiti alongside campaign slogans on the City Road footbridge. The graffiti (“곗聯”, “촬浪”) were alleged to mean Wang would “provide you with fake ID and drugs that make you sleep if elected”. Wang did not chalk an English version of the graffitti—a clear breach of the rule. Yet she argued the slogans were impossible to literally translate and could only be understood as a reference to Chinese graffiti art. They were intended to resonate with Chinese international students, she said, and involve them in the political process. The USU hopes that the Returning Officer, Penelope Crossley, who is a fluent Mandarin speaker, will be able to navigate the complexities of accuracy and equivalence in translation. She faces a big task: as Franki explained, “the rule applies to any written material which in any way publicly comments on the election (including electronic communications)”. This means Crossley may have to consider complaints involving social media and off-campus publications. Since the rule is now formally on the books, it will be uppermost in candidates’ minds when they are looking for grounds to complain against rivals’ campaigns. With rumours that at least two international students will contest this year’s election, the rule seems certain to be invoked more frequently.